パオは暑いですか？Is the Mongolian yurts hot inside? FAQ "Is the Mongolian yurts hot inside?" Yes, it's hot inside yurts in daytime, because of no air conditiner inside. But at night time, you feel much better with cold wind from ocean. If you cannot stand with hot, you can swim in beach to get cold. 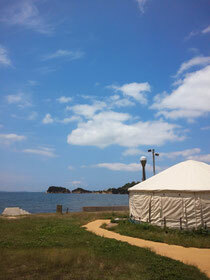 I think it's only the place in the world that you can stay in pao yurts, which near by beach.